Source of title proper: Title based on contents and provenance of records. Tom Innes, 1923-1999, was born in Salem, Oregon, USA. His family moved to the Calgary, Alberta area in 1928, and then to Vancouver, British Columbia a few years later. During the Second World War Innes served in the navy. He studied at Calgary's Provincial Institute of Technology and Art (now Alberta College of Art) for two years after the war, then worked at a variety of jobs before starting a commercial art studio in the mid-1950s. 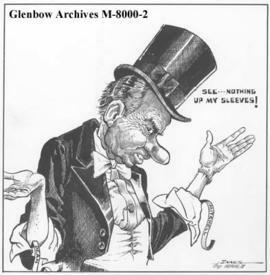 In 1956 he submitted a cartoon to the Calgary Herald which resulted in requests for more of his work. Within six months he was working full-time for the newspaper as an editorial cartoonist. He continued in this capacity until 1988. He won a National Newspaper Award in 1981 for his political cartoons, and two books of his cartoons have been published. For further information see The Lighter Side of Western Alienation : Depictions of Alienation in Editorial Cartoons / Gordon Lawrence Anderson. -- unpublished MA thesis, University of Calgary, 1989. This photographic collection was donated to the University of Calgary Public Affairs Office and stored in the Department of Communications Media.